Welcome to the website for the 9th Massachusetts Middle School Track and Field Championship Meet that is scheduled for Saturday, June 1, 2019. All middle school track and field athletes from public, private, parochial, and homeschools, in grades 5-8, who meet the qualifying standards, are welcome to participate. Please review the website for all meet information and registration deadlines. Divisions 1 and 3 will compete from 10:15-3:30. Division 2 will compete at 4:00. Deadline for Intent to Enter online form is Friday, May 17, 2019. Deadline for on-time CoachO entry is Friday, May 24, 2019. An additional fee of $50.00 is charged for Late CoachO entry between Saturday, May 25, 2019 and Tuesday, May 28, 2019, 2:00 pm. Meet Fee Payment or school purchase order must be received by Wednesday, May 29, 2019 or your team will not participate. No exceptions will be made. Meet Fee payment may be made online through CoachO or mailed to the meet director. All entry fee questions should be sent to the masschamps@gmail.com. No athlete may be entered in more than two events, including relays. Entry as an alternate counts as one of the athlete’s two events. There is a maximum of 3 entries, per school, per event. Schools may enter one relay team per event. Divisions are based on 2017-2018 enrollment data (grades 6-8) posted at the DESE website. Click HERE to determine your school’s enrollment and meet division. Division 1 – 701 and up. If a school has a grade that is not eligible to compete, the enrollment for that grade will be subtracted from the school’s total enrollment number (grades 6-8). 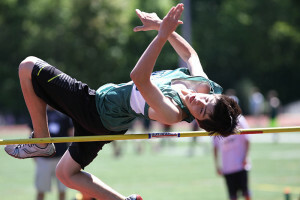 A letter from the school’s principal must be emailed to the meet director stating what grade is not eligible to compete. A copy of the school policy stating why that grade is not eligible to compete must be attached. Any team whose athletes are allowed to participate on a varsity team will placed one division higher since those athletes have a distinct advantage of competing at a higher level during the spring season. Private schools must email enrollment data (boys and girls) to the meet director. The top 8 finishers in each event (including relay teams) receive a medal. The top 3 boy’s and girl’s teams in each division will bring home a trophy. Athletes will compete by division on the track and in the field. All results will be posted on the fence near the concession stand. 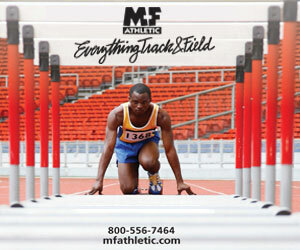 A minimum distance will be required for measurement of attempts in the long jump, shot put, discus, and turbo javelin. Timing for all track events is Fully Automatic Timing. Non-competitors (parents, coaches, and athletes) are NOT allowed inside the fence surrounding the track. There will be restricted access in the field event areas. An EMT and Athletic Trainer will be onsite. General admission is $6.00. The price includes a meet program. Kids under 12 get in for free. Meet T-shirts and sweatshirts will be sold.